Click here to view as webpage if you cannot read this email. 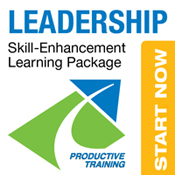 An easy way to help leaders boost their effectiveness. Over the last few years many of our clients have asked us for a cost effective way to get some practical tips, tools and insights into the hands and hearts of their leaders on a regular basis to keep their “saw sharpened”. Our challenge from an adult learning perspective has been – how can we best accomplish this in a way that has practical takeaways and stickiness for participants yet in a short format? After much discussion and planning on our end, we are excited to share with you our attempt to do just that. Starting Wednesday April 9th, we are launching a new 10-part webinar series with a variety of entertaining subject matter experts targeted especially for busy leaders who want to be at their best. Getting new input and insights is healthy for all leaders. It is no secret that we are at our best when we are growing or improving. So invest in yourself (or one of your down-line managers) by making time for one or more of these webinars conveniently delivered right to your desktop! • Click here to attend the entire series of 10 at a 40% savings for only $295!. Note that live webinar seating is limited and you will want to register early to ensure your spot. Topics may occasionally change due to guest experts’ availability. Effective leadership and team performance doesn’t just happen. Good input always precedes good output. We’ve been building organizational cohesiveness for many years. Please take a look at our website or contact us to discover how we might help you! Sent to you by Productive Training Services, 3000 Green Rd, Box 130857, Ann Arbor, MI 48113. Click here to unsubscribe by typing “unsubscribe” in the subject line if you no longer wish to receive our emails.